This is a lovely colourful mix of ingredients which makes it very tasty. It is enjoyable to have either as a side salad or a complete meal if you add prawns or tuna. I often serve it as one of the dishes at a buffet. The quantities can be adjusted for the number to be served. It also makes a delicious addition to picnic spreads. Add the pasta to a large pan of boiling salted water. Boil for 10 - 12 minutes until soft. Chop the cashews (if using). Dressing: crush the garlic and mix all the ingredients together, add the cream. 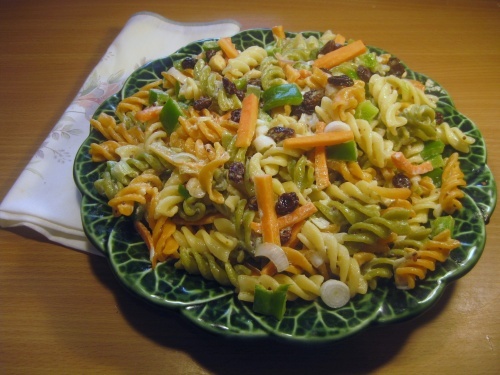 Drain the pasta, put into a bowl and add all the ingredients, including the dressing. Mix well and leave for at least half an hour for the flavours to develop.